A full cycle of your moon has come and gone since I last heard from Milethi, and finally she has produced new information. I find the results of her latest research to be simultaneously surprising and not. When her calculations of the earliest evolutionary form of the Vorox revealed a petite insect-like Rahi, I suspected that the Zesk may have had rather modest beginnings as well. What I did not expect, was to be shown something so nearly identical in overall shape and size to the prehistoric Vorox. From this it is clear to me, and Milethi agrees, that the Vorox and Zesk had a common evolutionary ancestor. In simpler terms, long ago, they were one and the same. I had actually heard long ago that this was the case, but the information was heavily disputed and speculation on the matter is widely considered taboo. 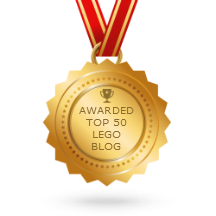 Fortunately my personal web of contacts and information spans great distances and time alike, and I have been able to assemble quite many useful pieces of this puzzle. I need but one further bit of research from Milethi, a further confirmation of sorts, to complete this story. She has agreed to my new request, thankfully, but unfortunately for me, this time she has requested more difficult "errands" in return. 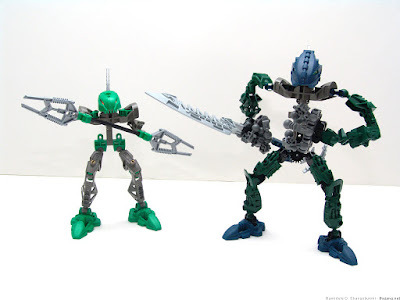 Today I present two of my older Bionicle MOCs, both non-canon Rahkshi. The first is the Great Rahkshi Kluurakh. 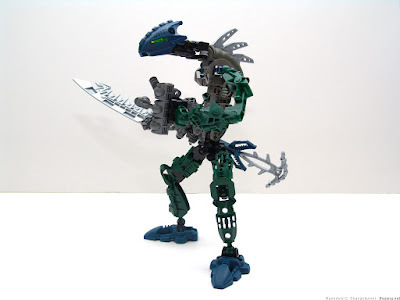 Kluurakh was formed from the exceedingly rare act of fusing a live Stage 7 kraata of Confusion into a Stage 7 armor. The unexpected result was a creature of extraordinary size, strength, and, to Terridax's dismay, intelligence. 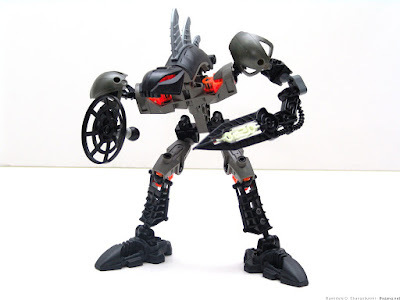 Kluurakh's will was strong enough that he was able to escape the Makuta's mental control, even in close proximity, and live as a free being. 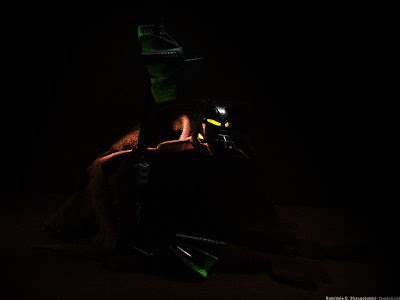 Not much is known of his life, though it is believed that he lives in deep caverns beneath Metru Nui to this day. Next up is Tierakh, pronounced "tee-eh-rock." Tierakh was raised & trained to be a personal bodyguard of Teridax. His most exceptional feature is his Shadow Shield, an intangible device powered by pure elemental shadow energy. It appears as a very small, shadowy field, but when an attack is inbound, whether physical or energy-based, the shadow force extends forth and concentrates ahead of where the attack is aimed, absorbing it and rendering it ineffective. 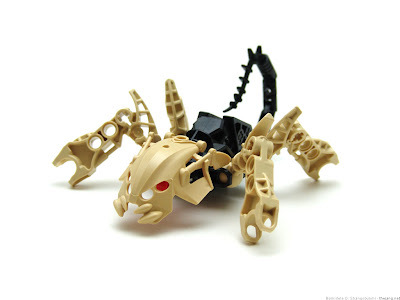 It is believed that Makuta Teridax absorbed the life force of Tierakh to supplement his own power in advance of usurping control of the body of Mata Nui.